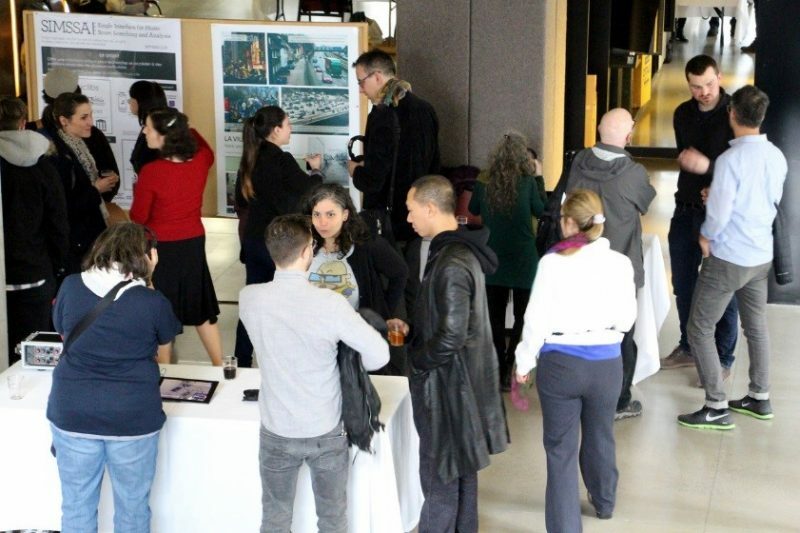 In the context of the 85th ACFAS conference (Association francophone pour le savoir) held at McGill University, our research group presented Sounds in the City: toward an acoustic urban design on May 10, 2017, during the Science-me event held for the general public. More than just an introduction to the concept of the urban soundscape, this was an opportunity to show a wider audience two ongoing projects. Florian Grond introduced his research on the way members of the blind community perceive urban noise. Listeners were immersed in the environment of a male participant as he traveled from his office downtown to his home, highlighting the obstacles along the way. Romain Dumoulin exhibited an application that allows urban designers to manipulate sound sources in a city space to see and experience them in real time. The application can simulate the soundscapes of spaces to better understand the acoustic impacts of planning decisions. The urban soundscape approach was presented by the principal investigator of the Sounds in the City team, Dr. Catherine Guastavino. The ACFAS conference is a yearly event that brings together a large group of researchers from all scientific domains and from some 30 different francophone countries. It represents an opportunity for francophone researchers to keep up to date on the latest discoveries, but also for those researchers to engage with the public.